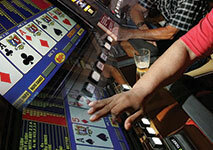 Video poker is undoubtedly one of the most famous casino games that can be played in almost every reputable casino. The game attracts hundreds of players every day as it gives them the chance to get a very different casino experience. Its rules and fundamentals are moderately easy to comprehend in comparison to the classic poker which makes the game suitable for all types of players, even inexperienced ones. Video poker is a game of both pure chance and luck and as such, the outcome of every hand can be influenced as long as gamblers are acquainted with the basic rules and strategy. In such casino games where skills can make the difference between winning and losing, players should bear in mind that with the right strategy and knowledge they have the chance to significantly lower the house edge. It is worth noting that many online casinos offer the chance to practise the game for free which allows players to get familiar with the gameplay without risking their own money. It is observable that the video poker machine has a lot in common with the slot one as seemingly it looks pretty much the same. Both machines have the same features – drop bucket, coin hopper and bill or coin acceptor. Even though the video poker machine highly resembles the slot device, its mechanism and the way it operates are not the same. When playing video poker, players are provided with a lot more information on the screen than they are when playing slots. Another important difference is the fact that all that reel slots games require is to simply pull the handle and hope for the best, whereas video poker can be influenced by the appropriate skills and knowledge. The so-called pay table, that every video poker machine has, is one of the most important aspects that players should consider prior to playing. The reason why is that the total amount they are going to win or lose, while playing, strictly depends on it and therefore, it is essential to choose a machine that offers a beneficial pay table. Video poker has the same basic rules and fundamental principles as draw poker. The possible combinations that players can form in their hand and the way they are ranked also remain the same. In most cases, players get 5 cards, dealt in the same manner as in the classic poker. After they receive the cards, they have the chance to either hold or replace each of them. After that, the machine replaces the chosen cards and players get paid depending on their hand value. In general, the standard video poker game uses a single deck of 52 cards. However, nowadays it is possible to try a number of interesting versions such as Deuces Wild and Jacks or Better which can also include the joker. Even though there are many similarities between classic poker and video poker, one of the major differences is that when playing video poker, players face a machine, instead of a table full of other gamblers. This way, it is possible to concentrate better and fully enjoy the game. Video poker is the perfect game for players who like to completely immerse into a favourite casino game undisturbed. Video poker appeals to a number of players as it gives them the chance to put their skills and strategy to the test and try their luck. Many variations also offer progressive jackpots, thanks to which it is possible to win big by playing a favourite casino game. Since the outcome of the game can be influenced by using appropriate skills, it is possible to make a profit in the long term. The only casino games that offer such a valuable opportunity are the strategy ones and thus, players should know how to make the most of every situation while playing video poker. In order to start a game, players should simply insert the amount of coins they want to play with. In most cases, the video poker machines accept from one to five coins, however, their number can vary, depending on the particular version. Some machines accept three or four coins, whereas others accept up to 100 coins. After players have inserted the desired amount of coins, they are automatically dealt their first five cards. Most machines immediately notify players in case they formed a winning hand combination by beeping and displaying the type of hand. At this point, players have to make an important decision which card to keep and which one to discard. After they have made up their mind, they can simply select the relevant cards by pressing the Hold button. There is one Hold button for all of the cards on the screen, conveniently located below them. In case that players have changed their mind and they wish to deselect a card, they can simply press the same Hold button. In general, players should switch the available cards they were dealt in an attempt to get better ones which might result in a winning hand. After that the cards are then compared to the winning combinations. If the total value of the hand is lower than the minimum requirements, players lose their bet. Analogically, if their total value is higher, the result is a win. It is worth mentioning that in cases where players have a winning hand, many video poker machines offer a playoff round in which they have the opportunity to double their profit. If players don’t want to participate in this additional round, they are free to collect their winnings. Video poker is one of the most popular games and as such, it has many enticing variations that have different house edge and odds. Some versions feature wild cards which significantly increase players’ chances of drawing a winning poker hand. 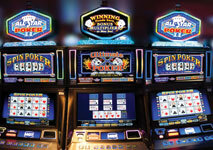 Other video poker games offer special bonus payouts for certain combinations. Every variation has its own winning combinations, according to which, players get paid. Some of the most popular variations include: Jacks or Better; Tens or Better; Deuce Wild and Bonus Poker. This is the most common variation of video poker that is available in a number of casinos. The aim of this game is to get the most valuable poker hand (Royal Flush). The lowest ranking hand that pays out is a pair of face valued cards (Jacks, Queens, Kings or Aces). Whenever players get a pair of Jacks, Queens, Kings or Aces. This hand consists of two different pairs of cards of the same rank. This hand consists of three cards that have the same value. This hand consists of five consecutive cards of different suits. This hand consists of five cards of the same suit that are not consecutive. This hand consists of three cards of the same rank and two other of the same type. This hand consists of four cards of the same rank. This hand consists of five consecutive cards of the same suit. This is the strongest hand in poker and it consists of the five highest value cards (Ace, King, Queen, Jack and Ten) of the same suit. This is another very popular version of video poker which attracts a number of players due to its interesting rules. As the name of the game hints, the deuces play a crucial role as they can serve as a substitution for any card in a similar way to jokers. Deuces Wild highly resembles the classic poker which makes it suitable for more traditional players. This is the lowest winning hand that consists of three cards of the same rank. The hand consists of five consecutive cards and their suit is irrelevant. The hand consists of five cards of the same suit that are not consecutive. This hand consists of three cards of the same rank and another pair of the same value. This hand consists of five cards of the same rank. This is the strongest hand in poker which consists of Jack, Queen, King, Ace and Ten. This hand consists of one or more deuces and the five highest value cards. This hand consists of two pairs of deuces and an extra card. Tens or Better is a famous variation of video poker that gets its name from the fact that the minimum paying hand is a pair of Tens, instead of a pair of Jacks. It is especially suitable for beginners, because the chances of getting a winning hand are quite high. However, in this video poker variation there are no wild cards and the payout for Full House and for Flush is significantly decreased. One pair pays out only if the cards in it are Tens or any of the higher ranking ones. This hand consists of three cards of the same rank. The other two cards are irrelevant. This hand consists of five consecutive cards that have different suits. This hand consists of three cards of the same rank and other two of the same rank. This is the strongest hand in poker which consists of Ten, King, Jack, Queen and Ace. This video poker game is based on the popular variation Jacks or Better with the difference that the payout percentage for Four of a Kind is much better. The lowest ranking hand is a pair of Jacks and the most valuable hand is Royal Flush. The Bonus Poker has numerous variations depending on the different bonus payouts based on the ranking of the Four of a kind. The table below provides payout schedule for Double Bonus Poker. One pair pays out only if the cards in it are Jacks, Queens, Kings, or Aces. This hand consists of three cards of the same rank. This hand consists of three cards of the same rank and two of another one. This hand consists of four cards of the same rank. The value of the cards should be at least 5 (all of the cards from 5, 6, 7, 8, 9, 10, Jacks, Queen to King are acceptable). This hand consists of four cards of the same rank. The value of the cards should be from 2 to 4 (2, 3 or 4). This hand consists of the five highest cards of the same suit.